The electric bus business model, which greatly reduces initial investment costs through wireless charging, will come our way. As compared to existing online electric buses or battery swappable buses, it has excellent performance and economy. So market expansion is forecast to gain speed. 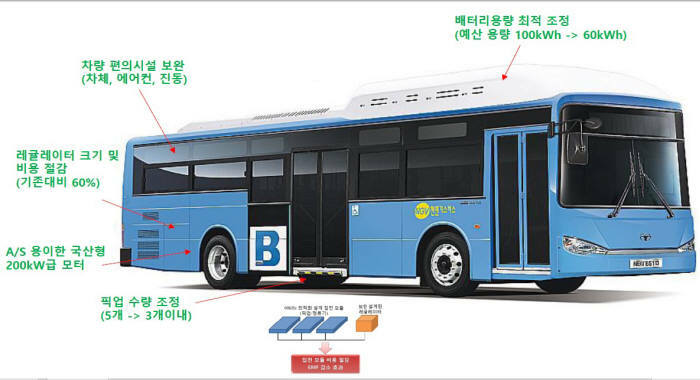 KAIST announced on January 5 that it recently embarked on the ‘low-cost wireless charging electric bus commercialization project` as part of the national project of the Korea Agency for Infrastructure Technology Advancement under the Ministry of Land, Infrastructure and Transport. It is planning to put them on bus routes as commercial vehicles by the end of this year. Daewoo Bus, LS Cable & System, Korea Electric Vehicle Service as well as Dongwon OLEV, which has the online charging technology, will participate in this project. Electric wires will be buried underneath the road to create a magnetic field, and receive magnetic force from this vehicle wirelessly and convert it into electricity, and this electric bus will use this electricity as a power source. Unlike ordinary electric vehicles that must stop by charging stations, it is capable of real-time charging while it is stopped for transfer, etc. For this reason, it can use only 20% of the existing electric bus battery capacity to run the same distance. As the battery gets smaller, the cost can be reduced and it weighs less, thereby greatly improving operating efficiency. KAIST recently decided to raise the charging efficiency from 70% to 85% for the project by enhancing the technology. The price competitiveness of the car and the charging infrastructure will be also greatly improved. As a matter of fact, KAIST says, electric buses, which used to cost at least KRW600 million~700 million, can be manufactured with KRW400 million, and the charging infrastructure can be built for KRW150 million, lower than the cost of the swappable charging method (KRW1.8 billion) or the online method (KRW230 million). This electric bus comes with the 200㎾ (260hp) electric motor and 60㎾h domestic lithium-ion secondary battery. When it is stopped, it uses the electric wire 20㎝ below for charging, and it takes less than 10 minutes to charge the electric bus. The domestic market has a bright prospect. Last year Gumi began to operate electric buses using the online method on a pilot basis, and in 2015 Seoul, Gimpo, Busan and Jeju are planning to introduce electric buses. It is said that the range of choice expanded in terms of urban transportation, environment and budgets.